With the rise of legal DIY document sites, everyone thinks that preparing a will is an incredibly easy task, but you have to be careful if you decide to go that route. As an Orlando estate planning attorney, I can’t tell you the number of times surviving relatives have brought me wills that have been filled out incorrectly because a lawyer wasn’t involved. Their deceased loved ones thought they were saving a few bucks by downloading the form and doing it themselves, but quite often the cost to fix any mistakes far outweighs the price they would have paid to have a lawyer create it in the first place. There are a number of common issues that come up with DIY wills, and if you don’t catch them ahead of time, you’re going to end up paying an Orlando estate planning attorney a lot of money to fix them retroactively—if that’s even possible. Here are just a few problems you may run into. Your DIY will has bequests going to beneficiaries on government assistance. Maybe you really want to make sure that your disabled brother is taken care of after you die but simply giving him money from your estate could negatively impact his disability benefits. Your DIY will doesn’t have a self-proving affidavit. 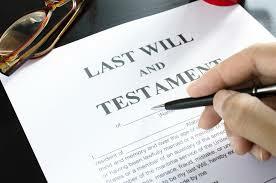 When you create your will, you will need to have people witness it and sign to prove that they’ve done so. Unfortunately, without a self-proving affidavit, your relatives will have to bring those people in to testify that the will is valid. Your DIY will doesn’t protect your assets from creditors. Without a spendthrift provision, none of the trust assets will be safe from the creditors of your trust beneficiary. Your DIY will doesn’t have an alternate trustee. It seems like a simple thing, but you need a trustee to carry out your will—what happens if the person you choose won’t do it or dies before you? Experienced estate lawyers know to include an alternate trustee. These are just a few of the problems that you can run into with DIY wills. Even if you don’t want to use a lawyer to draw up the actual document for you, it’s well worth your time to at least speak with them about your specific financial situation. That way, you can ensure that there aren’t any surprises awaiting your relatives after you’re gone. Remember, preparing a will may seem easy but even the most popular legal document sites like LegalZoom say that the vast majority of people using their services fill out the forms incorrectly!